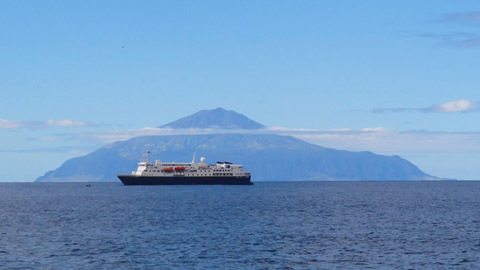 Reports of visits by cruise ships to Tristan da Cunha during the 2011/12 season. 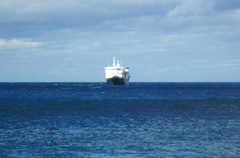 The Tristan community and Tourism Department were disappointed to hear the news that the planned 2012 visit of MV Plancius in April had been cancelled, but relieved that all were safe. See the Shipping Page for news of the ship and those aboard. 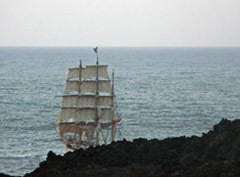 Views from shore of the Barque Europa, reputed to be a 'Pirate Ship' by Tristan youngsters! 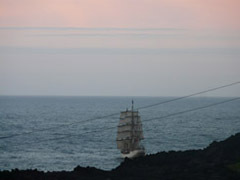 The Barque Europa arrived at Tristan in the early hours of 6th April which was Good Friday. It was a nice surprise to awake to a sailing ship resting calmly offshore. A few of the island children said it was a Pirate Ship so we had very quiet children over the Easter Weekend! 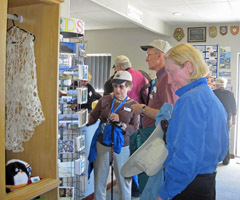 Passengers landed at about 9am in the morning and a few of the guests went on a tour of St Mary’s School, the Fish Factory and took part in a Golf Tournament. 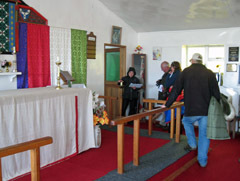 Due to it being Good Friday, which is strictly observed as a religious holiday on the island, the only venue open before Church was the Tourism Coffee Shop. 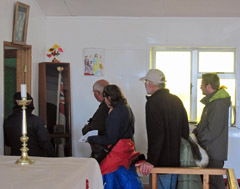 Church services were held at St Mary’s Anglican Church at 2:00 pm and St Joseph's Catholic Church at 2.30pm. Guests were invited to attend and there was a good turnout. At 3.30pm venues were opened and a walking tour of Edinburgh of the Seven Seas began. Weather was calm and sunny and there were even a few sunburnt faces to be seen. On Easter Saturday weather was still brilliant and everything returned to normal, the village was in full swing once again. 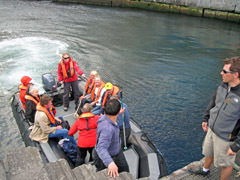 Eight guests arrived ashore with the first zodiac for a hike to the Base. All venues were opened and Beach Fishing was underway at 10:30am for 11 guests, the largest number of visitors ever taking part in fishing. 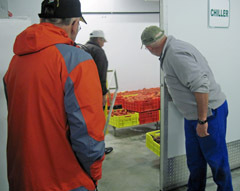 A cultural tour of the Potato Patches started at 11am and a tour of the 1961 Volcano at 2pm. 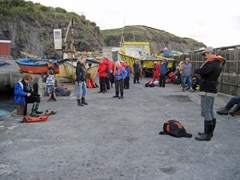 By early afternoon Base Hikers and Fishermen had returned to the Settlement where they enjoyed some cold beers at the Albatross Bar - what a treat!!! 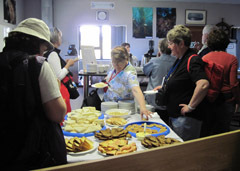 The Tourism Coffee Shop was kept very busy as lobster sandwiches and cakes were in very high demand. On Easter Sunday weather had deteriorated and so not all the guests came ashore. A few landed early to attend Church services at St Mary's and St Joseph's. Venues again were opened for a few hours, but many guests were just happy to enjoy the peace and tranquility of Tristan. It was hoped to do a visit of the Outer Islands on Easter Monday but weather did not look promising on Sunday afternoon so the Barque Europa took the decision to leave for Cape Town instead. So sad goodbyes were said and it was time to go but we look forward to seeing the ship again next year. The NG Explorer arrived at Tristan at 9am on Monday 19th March. There was a bit of a swell running and so Immigration officers were taken aboard to clear the ship before disembarking passengers. At midday sea conditions were very good and passengers disembarked. 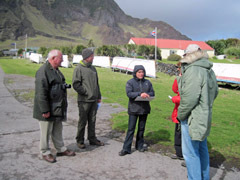 They were all greeted at the harbour by the Tourism Coordinator and met by Island Guides to begin tours of the 1961 Volcano, Settlement of Edinburgh and Potato Patches. A new path to the 1961 Volcano had just recently been completed and so NG Explorer guests were the first to try it out. Beach Fishing and Golf were also on offer and so four guests went off to Runaway Beach at the Potato Patches for a Fishing Trip and two guests went off to play Golf. Weather was beautiful with blue seas and sunny skies, thank goodness they had not arrived the day before as weather was very dismal with lots of rain and unsuitable sea conditions. 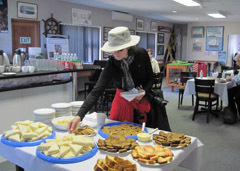 After everyone had completed their tours, an afternoon Tea Party was held at the Post Office & Tourism Centre, guests enjoyed lobster sandwiches, homemade pickle fish, a variety of cakes, mini milk tarts and beverages. The Centre was filled to bursting, but everyone really seemed to have enjoyed themselves. This is the first time an event like this has been planned for a Cruise ship visit. After tea a few more people went on a tour around the Settlement of Edinburgh and then all too soon the day was over and guests had to embark. Unfortunately we had three casualties on the day of the Explorer visit, this has not happened in quite a while and I can never recall having three in one day. First a lady collapsed at the harbour feeling most unwell with blurred vision, a Land Rover took her to the Visitors Centre where the Explorer’s doctor saw her and afterwards she enjoyed a cup of tea. The second lady Peggy collapsed in front of the Supermarket where she fell flat on her face and had to be rushed to hospital. This resulted in her staying on the island overnight. Unfortunately she was unable to visit the outer islands so the following day we took her on a personal tour of the Potato Patches, Settlement of Edinburgh and had her photo taken by the Welcome to the "Remotest Island” sign. 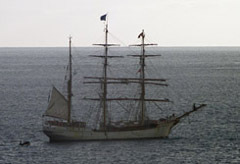 Peggy boarded the vessel on Explorer’s return trip from the Outer Islands and joined the ship on its voyage to Cape Town. The third incident was with one of the Zodiac drivers Stephanie, who had an accident while leaving the harbour and the next day had to be brought ashore and hospitalised. Stephanie is still on island with us and is being looked after in hospital by the medical team. We hope Stephanie will soon make a full recovery and be able to enjoy island life before she leaves the island to return home. To all her friends and family out there, rest assured she is well looked after by the Community of Tristan. 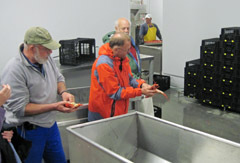 On Tuesday the 20th March Local Guides were taken aboard and the Explorer left for Nightingale Island. A landing was made and guests enjoyed half a day ashore at Nightingale seeing all the wildlife. The Explorer then left for Inaccessible where a landing was also made there, one of the local guides were fortunate enough to catch a Flightless Rail for all to see, you can imagine the excitement then. The Explorer returned to Tristan at 6pm, dropped off local guides and a few of the ship's expedition team to say farewell to Stephanie and to bring her some home comforts for her stay on Tristan. After all were back on board the Explorer set sail for Cape Town. We hope to see the ship back in our waters soon. Images taken at Calshot Harbour showing passengers on the quayside, boarding a Zodiac and on their way back to the ship. Hanseatic passengers joined their counterparts from MS Island Sky to enjoy a full morning ashore at Tristan on Christmas Day. 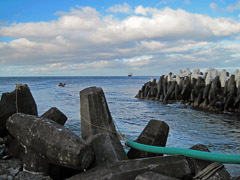 for Agulhas' passengers and below we show some events in the 2011 programme and in between is a report from Dawn Repetto. Pictures from Tina Glass of the Craft Day held in the Tourism Centre on 22nd September. 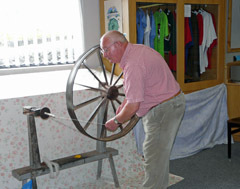 UK Tristan Government Representative Chris Bates, try their hand at spinning wool. The visit of the Agulhas this year marked a very special one as it was her very last trip to Tristan. I have fond memories of her visits as do many others, when as children we can remember the great excitement of the helicopter arriving. The Agulhas arrived early afternoon to weather which was not kind and passengers had to be disembarked by helicopter with very little luggage. Fortunately Tristan is well known for helping sailors in distress so for the first few days clothes were borrowed and shared and eventually three days later, luggage and medical supplies was offloaded to everyone's relief. A visitors programme was sent out for the visit and it outlined a few activities that would be happening over the Agulhas stay. First on the agenda was a cultural trip to the 1961 Volcano on 19 th September. Only one visitor signed up for this walk but it was a very enjoyable one with some great views of the settlement. 2011 marks a very special year as it is 50 years since the volcanic eruption and the community's evacuation to the UK. On Wednesday 21 st September a guided tour of St Mary’s school was on offer. Well-attended, Jim Kerr our Education Advisor, showed everyone around the school and told them of plans for the future. It was a chance to meet the island children and for everyone to see what the worlds remotest school looks like. Being remote comes with many challenges and I know the teachers, children and community are very grateful for the support that is given from overseas. 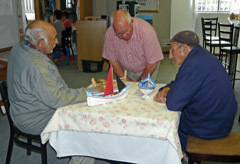 On Thursday 22 nd September a Craft Day was held at the Tourism Centre. Visitors had the opportunity to see how the carding and spinning of local wool was carried out and how model longboats were made for collectors items. 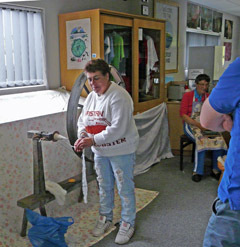 Visitors had a go at carding and spinning and I think discovered as I did that this is not an easy task. A reception was given by the Chief Islander Ian Lavarello on Sunday 25th September. 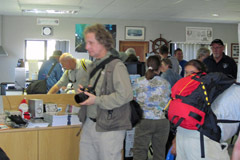 It was a great opportunity to catch up with all who were visiting on the Agulhas. Ian gave a speech in which he thanked Dr Cornelius for his time with us as Island Doctor and to Dr Loran (an island friend) for all his help at the hospital. Being a doctor here is never an easy task, so we are extremely grateful for all those who undertakes this job. 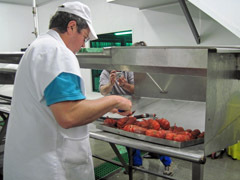 On Monday 26th September the Factory Manager organised a tour of the Factory and provided cooked lobster for everyone to sample. Caught the day before, it tasted divine and was thoroughly enjoyed by all who attended. 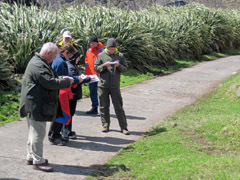 On Thursday 29th September a newly designed Self Guided Heritage Trail was trialled with the visitors. This small leaflet covers some of Tristan’s early history and includes information on the Longboats which played a very important part in islanders survival, the cemeteries, the homes where the first settlers lived, Prince Philip Hall and the two churches. Feedback was very good and all comments were taken on board and I now feel we have a great leaflet that will be enjoyed by all. The trail took us about two hours to complete and afterwards everyone returned to the visitors centre where they enjoyed some well earned hot coffee. On 1st October the island Administrator held a reception for the community and visitors. The Admin gave a speech in which he updated everyone on the Oliva disaster. Thanks were extended to Loran Bonnardot, Dr Cornelius and his family, the doctors wife Helena (who very kindly taught Afrikaans lessons at school), Chris Bates our UK Representative, Frank Wastell (visiting Lawyer) and his wife Lorna who helped at the school and hospital, Martin Bester, Brad Robson (visiting Conservationist), the two visiting divers Sue Scott and Geoff Fridghon and of course our great dental team Penny Granger and Bob Carse and the Optician Priscilla Brown. The reception was followed by the famous Tristan dance where everyone had a great time and danced until early hours of the morning. 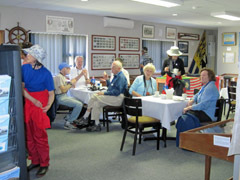 On Monday 3rd October a Golf Tournament was held and was very well attended. Our island Administrator played and afterwards he provided cold beers and snacks for the happy golfers. Thomas Lafaille (the visiting CTBTO scientist who had been here for 8 months) held a reception and dance on Tuesday 4th October. Thomas thanked everyone for all their help and kindness to him over his time spent on Tristan. Thomas will be missed and the community wishes him Good Luck for the future. At this reception Anne Green the Education Officer and historian was presented with a photograph from Chris Carnegy from BBC Radio Solent’s to commemorate the evacuation of the islanders to Hampshire. Anne has carried out lots of work on the island’s history over the years and if ever I am in doubt about any history aspect you can always rely on Anne for an answer. left by a flax hedge and right by the longboats along The Residency home of Administrator Sean Burns. 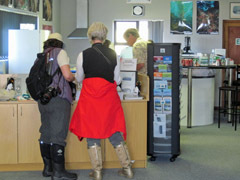 The Coffee Shop went into overdrive while the Agulhas visitors were here and it has been great to see the Centre full of people enjoying refreshments and food. Sandwiches, muffins and homemade biscuits were provided everyday but on a Wednesday a light lunch was organised and included Savoury Sausage Rolls, Pea Soup and Roll and Bacon and Egg pies. 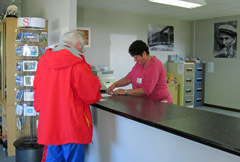 Tina, our Tourism Officer, organises the Coffee Shop and has definitely had a busy but enjoyable time. I think she will welcome a good rest after the Agulhas leaves. Trevor Glass our Conservation Officer has been busy with visits to the outer islands and Caves carrying out Penguin and Seal research. He very kindly took along all visitors on his conservation trips and after speaking with them when they returned I think they considered it a trip of a lifetime. It is with sadness that the island must say goodbye to our dear friend Loran Bonnardot. Loran has been a friend to the island for 15 years and has made three trips here where each time he has stayed for a few months. Whenever Loran has visited he has always helped out voluntarily at the hospital or assisted with families who have been nursing elderly people at home. People like Loran don’t come along everyday and the community is very grateful that he has found us and considers Tristan his second home. Loran will be missed dearly but we hope to see him back in the near future. 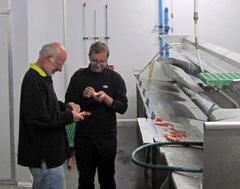 Chris Bates our UK Representative and his family visited with the Agulhas and it was great to see Chris again. His son Rob works in the Tourism Industry and we are grateful for the advice he has given us. Chris does a lot of great work for the island in the UK helping to raise awareness and to speak at important meetings and conferences on our behalf. The community is extremely grateful and wishes to extend their thanks to him. Much has happened over the last few weeks so if I have forgotten any important events or people, please accept my apologies. The Agulhas visit is always a busy time with a whirlwind of parties and so this leaves our memories not as good as usual. The islanders had the great pleasure in welcoming Sean and Marina’s son Damian Burns. Damian soon got stuck into island life and took the opportunity to partake in all the activities and excursions that were happening. To all our lovely visitors this year, we had a great time with you all and hope you will take home fond memories of Tristan and its people. Tristan is very remote and so we commend all those travellers who brave the trip.